The healing crisis occurs when the body's natural healing process is accelerated after some form of healing work and then undergoes a process of purging unwanted toxins, impurities and old thought patterns. The healing crisis can occur after a hands-on healing session, a distance-healing session, an attunement or your own meditative healing work. At these times, the healing crisis can temporary increase symptoms and as a result, you may feel worse and therefore conclude that the healing is not working. In fact, these signals are telling you the exact opposite. As you re-experience these symptoms or emotional imbalances, this is your body's way of telling you that there is a great deal of healing being done and that your body is releasing impurities and old thought patterns so that you can then love closer to full and long lasting health and happiness. It is a process of deep cleansing and healing. It is important to understand that such reactions are only every temporary and can occur immediately, within several days, or even several weeks, after a session (depending on the energies which are moving / being released). Symptoms usually pass within 1-3 days, but on very rare occasions can last up to a few weeks. If you are suffering from a major illness, the symptoms you experience during the healing crisis may be identical to the disease itself. Sometimes discomfort during the healing crisis is of greater intensity than when you were developing the chronic disease. This may explain why there may be a brief flare-up in one's condition. 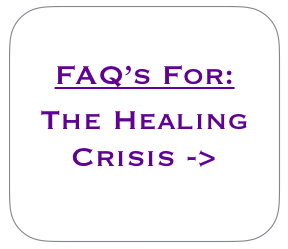 - What is a healing crisis? - What are the symptoms of a healing crisis? - What other things should I be aware of when healing? - How can I help ease the healing crisis?